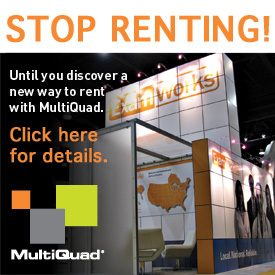 MultiQuad Bridge Systems give you the ability to add visual impact to your exhibit by utilizing the space between your MultiQuad walls or towers. You’ll be able to broadcast a marketing message or your company logo high above the competition and get more visual surface area of your booth space. Plus the addition of bridges gives a completed "wow" factor to your exhibit for look normally reserved for only custom exhibits. This system requires no tools and it simply hooks over the top of your existing frames. No modification is necessary as this product is ready to go right outside of the box. Just assemble using the "Paint By Numbers" color coded system, attach and go. 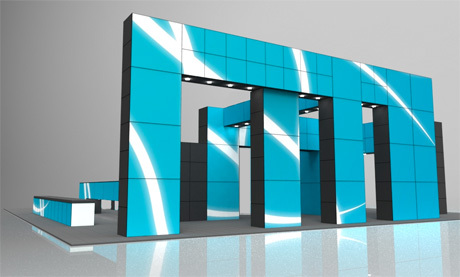 ExpoDisplays has created eight standard bridge system kits for use in your MultiQuad exhibit.